You can’t Protect Your God Granted Rights by Supporting Evil Candidates, Office Holders or Parties! 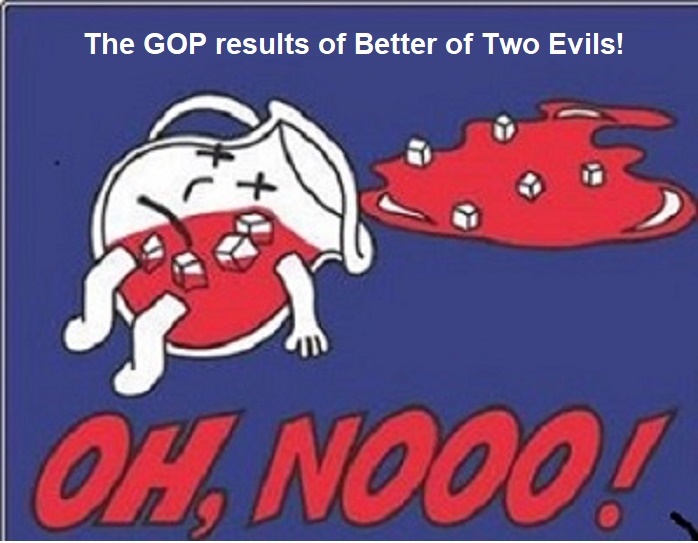 The GOP has been preaching it’s Doctrine of Vote 4 the Better of Two Evils for Decades now and the Rank & File have followed it for the most part and Ended Up in the Ditch as a result of Blindly following their Party Leadership rather than the Christian Values most were raised to believe in from the very Foundation of the United States of America. Lets take a closer look at this in a way all of us can relate to, if our families, friends, employers or companies we do business with Lied to us over and over again what would we do? I was raised in a home with Christian Values, thereby being taught not to do Evil and most certainly not to associate with those who do. My concern is that to follow the GOP Doctrine of Voting for the Better of Two Evils means I’d have to deny the very Faith I follow and it’s pointed out very clearly if one only reads the Proverbs in the Old Testament as it warns us against Evil over and over again and not to have any part with it. I believe most will remember the saying of Hear No Evil, Speak No Evil and See No Evil, this is a very simple lesson telling all of us how to live, don’t listen, speak or watch Evil and if we stopped allowing Evil to influence us we’d all be much better off at all levels, and yet the GOP tells us to Vote 4 Evil, I don’t believe it’s possible to do both, so I’ll continue not supporting the Evil Candidates the GOP continues to promote and believe if others would do the same we’d actually be able to Restore Our Nation to the Republic we were once given, and if not then the Words on our Currency are meaningless as we’re not truly following the Direction they’re meant to lead us in which is ( In God We Trust ) , or the Pledge of Allegiance ( One Nation Under God ), you see the direction given to us by these statements is in direct conflict with the GOP Doctrine of Vote 4 the Better of Two Evils. I know many will say it’s not possible to do this, however many say all things are Possible with God, but then say this isn’t, well if you pray for God to heal our Nation and then continue to follow the GOP Doctrine of Better of Two Evils don’t be Surprised when there’s not a Healing as following the Direction of the GOP’s Doctrine rather than the Word of God won’t allow God to Heal Our Land since the actions we take violate His Word, please recall Our Founders told us it Will Take a Moral People to Maintain this Republic and there’s nothing Moral about Voting for Evil. We had several of our AZ State Representatives vote 4 the NPV, all were Re-Elected and Four were promoted to the AZ Senate, most in AZ don’t even realize this bill would have removed our U.S. 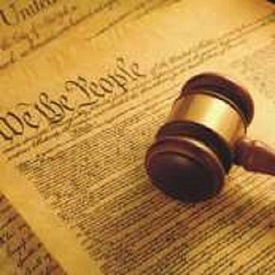 Constitutional Right to have a Republic Form of Government, in other Words their Votes Violated Our God Granted Rights, so not certain what some of you may believe is Evil but for me their Votes proved for me they sold out to a Lobbyist vs. keeping their Oath, so Evil is what Evil does, and you can all be certain in LD 22 I didn’t vote 4 the GOP Legislators on the Ballot, nor do I vote for the Evil Democrats, you see our Elections are actually a Battle Between Good & Evil. We All must make a Decision on which side we take, and Jean & I have made Ours. as so called Political Security Loyalty isn’t Worth Our Freedom.